"Dare to Prepare, draws on Ronald Shapiro's extraordinary career as one of American's top negotiators and lawyers. Full of real-life examples, Shapiro shows how meticulous planning can raise the odds of success in business and in life." --Norman Pearlstine, former managing editor of The Wall Street Journal and editor in chief of Time Inc.
"Ron Shapiro's emphasis on preparation is dead-on. The proven strategies he shares here, drawn from both his successful life as a businessman, sports agent, and a father, and numerous fascinating successful leaders in a variety of other industries, can help anyone be better at his/her endeavors. This book is a must-have for anyone looking to get ahead in life. Ron Shapiro has always had a lot to teach people about success in work and in life. Dare to Prepare might be his best guide yet." --Billy Beane, General Manager, Oakland Athletics, and the subject of the bestselling book Moneyball. "Ron Shapiro offers the reader valuable insights and methods that have universal application for facing the diverse challenges of life. He explains how thoughtful preparation empowers one to succeed in important personal and professional endeavors." "Dare to Prepare conveys Ron's down-to-earth wisdom about the critical first step in the success cycle... and it has application to every challenge we face in life, work and relationships." --David Barrett, President & CEO, Hearst-Argyle Television, Inc.
"As a psychiatrist and teacher I love this book. It does three things better than any other. It offers a thoughtful structure for thinking through a life problem to its solution. It provides stories with fascinating plots and outcomes which make each of the steps in the structure clear and memorable, and it promotes a feeling of relief through revealing to readers like me that we are not so different from everyone else in often failing to make a plan primarily because we're not sure how." "Using interviews with "master preparers" and high achievers like Jets coach Eric Mangini, a heroic woman who battles wildfires, a high powered television executive, and historian Taylor Branch, Ron Shapiro shows how their preparation secrets, properly utilized, can pave the way to success. Whether you are an entrepreneur planning to build a better mousetrap, a businessperson entering a negotiation or a historian starting a new book, I believe that you can learn -and profit- from Ron Shapiro's winning strategies. I did." "Once again Ron Shapiro puts into focus the concepts we all think about, but often do not practice. Dare to Prepare is the blueprint for obtaining results. Ron is the master at assembling the tools for success, organizing them in plain speak and delivering them to us so we can score. This is a must read." "Ron Shapiro has written a passionate, timely and highly effective guide to business endeavors. His zeal for preparation and powerful anecdotes are a formula for success. I will borrow from it shamelessly." "This book reflects years of experience, and of wisdom gained, through the careful preparation and resulting success of professionals in a variety of fields -- from athletics to the arts... Anyone who wants to be a successful negotiator, speaker, fundraiser, or leader will find these stories both enlightening and entertaining." "Shapiro presents a compelling case for how 8 simple steps can make you, your team and your partners all winners - if you only have the discipline! And if that is something you're lacking, he'll show you how to overcome that too!" "Ron has done it again; Dare to Prepare is an excellent and interesting read. Real life stories emphasize how critical it is to properly prepare for any important negotiation. From sports examples to business and even hostage negotiation, Ron makes a compelling case to take the time and prepare the right way and "win before you begin." "Ron Shapiro provides a clear and compelling read for everyone. This book conveys the obvious but often overlooked fact that preparation is the key to success. And he makes his preparation system compelling with stories from highly successful people from all walks of life." "Ron Shapiro, the torch bearer for the Power of Nice, reveals with great insight another key to success, the Power of Preparation. Vivid accounts from Ron's career and the careers of an array of interesting people show convincingly that achieving positive outcomes through preparation applies to all personal interactions whether with family, friends, neighbors, or business." "This is absolutely essential information for anyone from business leaders to business students. Ron Shapiro has done a wonderful job of immediately engaging the readers and never losing them, as he shares lessons learned about the value of preparing with deliberate purpose...the purpose to succeed. One only has to Dare to Prepare in order to stay ahead of the competition." 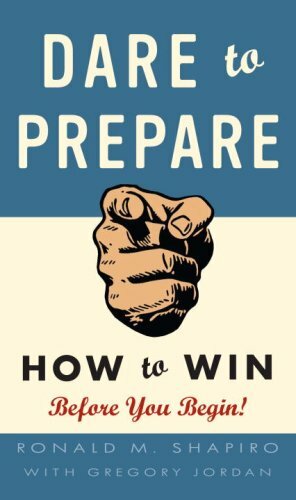 "Whether you are educating a sales force, managers, or front-line company representatives, or just looking to improve your own efficiency and success rate, this book is a great resource"
"This book shows that leadership is not just about instinct, charisma, and rhetoric; it's even more about preparation, planning, and perspiration. We owe it to the next generation to think before we speak and to plan before we act. With the use of compelling real-life examples and anecdotes from leaders from all sectors, Dare to Prepare is an indispensable primer for effective decision-making and impactful action." "Once again Ron Shapiro shares important principles drawn from the personal experiences of many about how to achieve winning results. Example after example makes it clear that more preparation, organization and the application of a well thought methodology will help us all be the best that we can be." "In Dare to Prepare, Ron Shapiro assembles compelling narratives from his broad experiences that will inspire you and provide you with practical tools to be a winning preparer, negotiator and communicator." "The journey is the destination for Shapiro's loyal readers. In the same way that professional athletes prepare completely, this book provides the insights for business strategists to play at the top of their game. Two types exist in the business world today. Those who read Shapiro's book and heed his advice will hike their success rate in practice. And then, there are the others..."
"Ron Shapiro takes what you might think you know - the idea that it is wise to have a plan - and fills it brimful of life by showing how a wide variety of people actually act on the idea. A book with a chapter titled 'I would like to thank the Lord Jesus Christ and Eric Mangini' contains many delights." --George F. Will, Pulitzer Prize-winning newspaper columnist, journalist, and author. "Leadership is about responsibility. Accepting this responsibility changes the game in any leadership role......and being 'in charge' means you have an obligation to everyone you lead to be the best. Don't be fooled ....it all starts with preparedness. Ron Shapiro's Dare to Prepare finally captures that evasive element of leadership in a way that all leaders ...present and future....can utilize in reaching their goals. Bravo...required reading for any leader!" --Jon Luther, Chairman and CEO, Dunkin' Brands, Inc.
"Explicitly recognizing the importance of preparation and then learning from examples how to do it effectively can be tremendously valuable. Dare to Prepare is a great way to do this!" Over the course of a forty-year career in the worlds of law, sports, business, and politics, Ron Shapiro has worked with and advised an incredible variety of people. What he’s found is that the secret ingredient for getting into the winner’s circle is simply the discipline of methodical preparation: that old-school, step-by-step way of having all your ducks in a row, whether you are an executive getting ready to do a deal or make a speech; a pitcher studying the traits of opposing hitters and keeping a meticulous notebook of their strengths and weaknesses; an international trade negotiator who knows all about the issues and the people on the other side before sitting down at the table; or a surgeon who rehearses like a classical musician. Deep down, you know you should do it. But how often do you wing it and fly by the seat of your pants because “Gosh, I don’t have time . . . I’ve done this before . . . I know what I’m doing”? It is obvious that you have to get ready for whatever game you’re playing, but all too frequently methodical preparation is the missing ingredient in today’s world of instant analysis, easy access to information, and glibness that sounds good at first but is unconnected with the reality at hand. 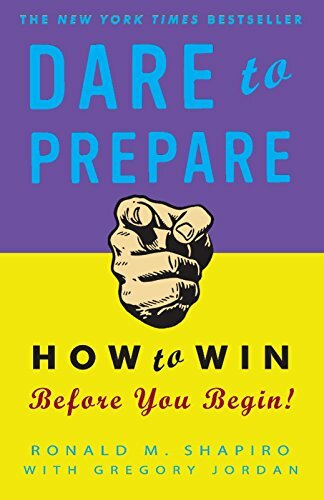 In Dare to Prepare, successful people such as wine guru Robert Parker, investment legend Bill Miller, pianist Leon Fleisher, Goldman Sachs partner Lisa Fontenelli, broadcaster Bob Costas, firefighter Ann Marie Tierney, New York Mets manager Willie Randolph, and many others share the way they apply discipline in preparing for career-changing games, deals, meetings, and interviews. Cal Ripken Jr. played thousands of games in the major leagues but prepared for each like it was his first. NPR host Liane Hansen has interviewed countless people but approaches each interview with the same meticulous research time and time again. Make sure there are no slips “twixt cup and lip” as you get ready for your next personal or professional challenge by daring to prepare.